Black Friday lens deal: get £600 off the Canon EF 100-400mm f/4.5-5.6L IS II USM - its best-ever price! Great Canon lens at a superb price. 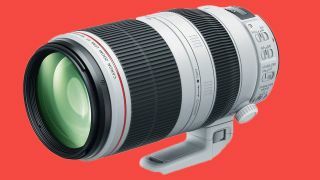 The Canon EF 100-400mm f/4.5-5.6L IS II USM lens is one of the best super-telephoto zooms available for Canon cameras and now it's been given such a big price reduction, it's an essential buy. In this brilliant Canon Black Friday deal, UK camera retailer Wex has added a double cashback offer to this lens, which means that you get an amazing £600 off the original price. This takes the lens down from £1,999 to £1,399 which is a fantastic Black Friday camera deal. It has a 4-stop image stabilizer on board which, coupled with its high-quality optics, delivers superb sharpness. This is the best price we've seen for this lens. Before this, Jessops had sold it for £1,449 previously. It’s worth noting that it is also doing the same cashback offer at the moment.